Help us kick-off the 8th Annual Mt Horeb Area Scandihoovian Winter Festival at the Tomte Party! Held on Friday, February 1st from 6 to 9 p.m in The Pizzeria. 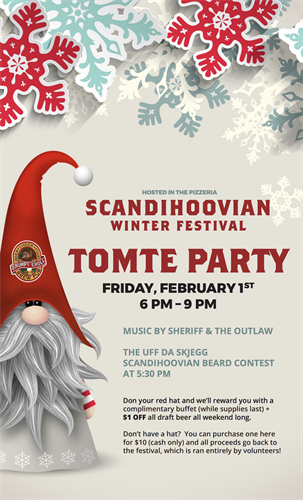 A Pizza Buffet and music by Sheriff & the Outlaw as well as the Uff Da Skjegg: A Scandihoovian Beard Contest! Don your red hat and we'll reward you with a complimentary buffet (while supplies last) + $ 1 off all draft beer (runs all weekend long). If you don't have a hat, you can purchase one here for $10 (cash only) and all proceeds go back to the festival, which is ran entirely by volunteers! *There will be no to-go containers and the buffet will only available until the food is gone.